Color exactly as described. Very soft once washed. A touch on the thin side, but overall very pleased. MAXIMUM COMFORT: Sleep better and wake up feeling refreshed ready to take on the day! Our superior down alternative premium comforters are luxuriously soft and fulffy. The best down alternative for allergy free comfort all year round. PREMIUM QUALITY: Generous all season down alternative plush polyester filling. Made from ultra soft premium mircofiber fabric. Gentle on skin, shell and filling made from 100% hypoallergenic materials. Durable sewn through box stitch design prevents fill shift. REVERSIBLE & HYPOALLERGENIC: Ultrasoft wrinkle resistant microfiber is breathable, stain resistant, hypoallergenic, and resistant to dust mites. Fully elasticized deep pocket fitted sheet fits your mattress snug from 5 inches up to 15 inches deep. EASY CARE: Machine wash in cold water with similar colors. Tumble dry low. Do not bleach. 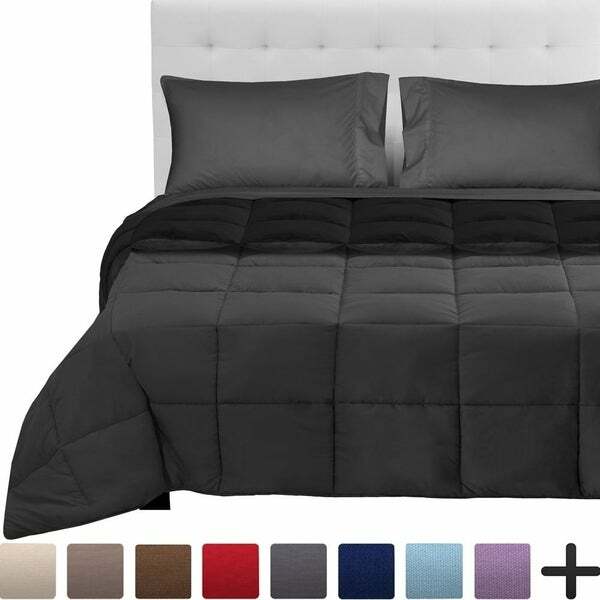 1 Twin/Twin XL Reversible Comforter 66" x 92"
1 Standard Pillowcase 20" x 30"
1 Twin Flat Sheet 66" x 96"
1 Twin XL Flat Sheet 66" x 100"
1 Full/Queen Reversible Comforter 88" x 90"
1 Full Flat Sheet 81" x 96"
1 Full XL Flat Sheet 81" x 104"
1 Queen Flat Sheet 90" x 102"
1 King/Cal King Reversible Comforter 104" x 90"
1 King Flat Sheet 108" x 102"
1 Cal King Flat Sheet 108" x 102"
Perfect for a dorm room! Bought the twin xl and it fit the dorm room bed perfectly. Comfortable material and well made. Washes well. Pockets on sheet easily able to fit over a memory foam mattress topper and mattress pad. We bought this for our son and he loves them. No issues at this time. Overstock always has the odd size sheets such as twin and full xl. The stuffing is coming out and looks terrible on black side. They sent two full size sheets I steal of one king size fitted sheet. I do not recommend this product. This bed in a bag is a dream come true. My son just got a new bed and I thought how great it would be if he also had new bedding. When it arrived, I was impressed with the quality of the product. Light on one side and dark on the other and yet when washed nothing happened. That is amazing. Once on the bed, my son loved the soft sheets and pillows. He was so happy with the reversable comforter. He loves to change up the room and with the reversable comforter it was a snap. His bed looked so nice and comfortable I had to just lay on it. Oh the soft comforter and the soft pillows felt so good, I did not want to move. I'm so glad that this product is above expectation. My son now likes his bed, which means he goes to bed with no hassle. This is going to be a blessing when school starts. I'm thinking of getting another one for my yonger son. Thank you so much Overstock for being my one place to go. Anything I need, I don't hesitate to buy because the quality of your products always superceed my expactations. I bought this for my teenage son's bedroom, as he is on an "all black" decor phase right now. The comforter was really nice, very durable and extremely comfortable. The sheets were a full\queen combo type sheet, so they were slightly loose on his full mattress, but they are well made and very soft. Overall, my son was very satisfied with this bed set. This set looks and feels very soft and nice. The comforter isn't bulky, but still feels warm. The twin fitted sheet seems a little big though, like it's really a twin XL. Bought this set for my daughter. She loved it. What she loved the most about this blanket is it is a full sized blanket, fits and covers her queen size bed. Very soft and cozy. Great color selection. Soft and warm and washes well; fits in standard washer and dryer. Fits bed nicely and true to size. Good for college students and teens. In my opinion, it’s exactly what I needed. It’s hard now these days to buy a comfort set with fitted and flat sheets, along with the set. The black looks cute against my navy blue wall and the material is extremely soft too. It’s perfect for the cold nights in MA. Purchased as an alternative for my son. The color is nice and and I like that it can be reversible. It was also great that it came sheets. Reasonably good quality. For the price, it is fine for my guest room. Super comfortable, so says my college granddaughter since I got this for her dorm room. Quality material for the comforter and sheets. Very smooth and not too thick or bulky, but good enough to keep your warm on those cold winter nights. Very happy with my purchase. Perfect for my teenagers room! The comforter was a bit light weight for me but he doesn’t seem to mind. Once it was washed it fluffed up. The solid color options were just what we were looking for. I love the rich colors. "What is the threadcount on this set?"